There were two Boy Scout rockets fired on April 27, 1960. The rockets were launched at Raeren, Belgium. One was the Dan Beard rocket and one was the Baden-Powell II rocket. Dr. A.J. de Bruijn created presentation cards for this event which he signed. 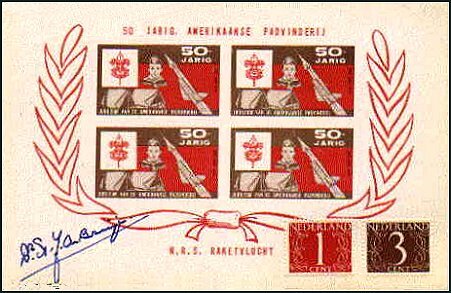 The card features an imperforate block of 4 Scout Rocket local post stamps. 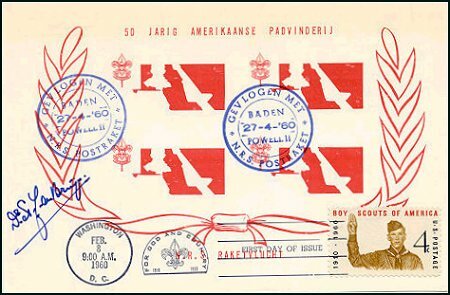 This second example of the presentation card also featured an imperforate block of Scout Rocket local post stamps. It is one of two missing color errors known for this issue.